Hey Jr High, High School & All Star Cheer & Dance team coaches. 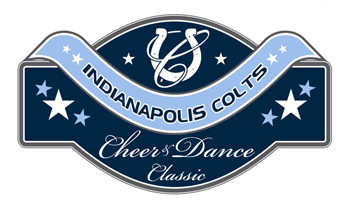 If you love to compete against the best competition in the state, enjoy watching the Indianapolis Colts Cheerleaders perform, and want to show you are COLTSTRONG, then register for the 1st Annual Indianapolis Colts Cheer & Dance Classic. Come join the state’s top young performers and battle it out at Brebeuf Jesuit Preparatory School in Indianapolis on November 11th for a chance to take home the title as best in your division. Throughout the day enjoy many Colts related surprises, including performances from the Indianapolis Colts Cheer and Jr. Cheerleaders. Visit USA Sports Production to view the registration, waiver, and team roster forms, as well as a list of the rules and divisions competing. Our boys in blue might not be competing on the 11th, but that doesn’t mean you should take Sunday off as well. Go to http://www.championscupseries.com/cheer/2011/circlecity/index.html and register your team today. Show why your cheer squad or dance troupe is COLTSTRONG this November and be a part of the 1st Annual Indianapolis Colts Cheer & Dance Classic.